The game is a cooperative puzzler for three players and your goal is to ferry a large orb of glowing light through a pitch black world, where stepping into the darkness will instantly kill you. This includes stepping into the shadow of any of the other players, something that makes maneuvering around a more fun and challenging exercise requiring some communication. Right now most of the obstacles in the game are centered around using light and shadow to solve puzzles, but we have several ideas to integrate more physical puzzles as well. Hopefully we'll have a more complete prototype ready for GDC! Our main concern right now is if a cooperative game for three players only would be marketable enough. We feel like a lot of the gameplay uniqueness disappears with less than three players, which make us less interested in creating content for a one or two player mode, even though players might be more inclined to try a game they don't need two friends to play. What do you guys think? If the game play enjoyment is in the communication with friends, then this is a tough call. I'm guessing this won't work for Internet multiplayer, although LAN should be cool. Maybe for a single or two player mode you could introduce some form of AI that behaves and communicates similar to a human player? the game look really nice. i love the animations of the characters. for the 3 players, of course it's seems really difficult to convince lot of people. but, if your game design is based on the cooperation of 3 players, i think you should go with this. it's really impressive for one week, so if in the end you see that nobody is interest with your concept, maybe you should finish this one, and then make something completly different instead of twist it. well that what i'm think about this, good luck ! This is absolutely stunning, really love it when mechanics play with light, something so intrinsically tied to our emotions. I love the animations, they are wonderfully smooth. The sound design for when the orb collides and the puzzle design so far is just spectacular! In regards to having the ability to play with less people I agree with aaron that a simple AI which can be given commands and stays within the orb's light and then a button to switch between each character would maybe allow a single person or two people to play. But that could take away the fun of coordination. The silence at the end of the level going in to the light is so perfect. Really excited to see more of this game! What you you developing it in? We did discuss having AI companions, but we will try to avoid it if possible. The thought of getting killed by one is just too frustrating to bear We're going to have a go at implementing the controls Brothers-style, so you can control one player with each analog stick, making it possible for one player to control two characters simultaneously. We also might introduce some areas that are well-suited for one player controlling two characters. jctwood: We're using Unity, which is our engine of choice. It's not perfect, but it is pretty great, and it works well both for prototyping and full scale production. Love it. I want a full game please. EDIT: And please change the name, after I posted this, I tried to come back to it and only found it by the description. "Light Orb" is a very silly name but easy to remember once you see a picture of this game. Art direction is great and monochrome games are always good to look. If you make the game 3 players only then you will put off a lot of people. Finding people to play can be effort and people sometimes just want to jump in. AI assisted companions could be a lot of work - how about having it where you can switch between characters? Failing that maybe a single player mode which exists seperate from the multiplayer? 3d artist and indie game dev, which you can follow below. Looks great, also loving the minimalistic sound design. Gives it a very eerie atmosphere. We've been working on controls and the respawning system since last time, which really isn't all that fun to show, but we did put in these timed spikes in the floor to create a break from the puzzle solving and vary the challenges a bit. More than one of you mentioned that we would be limiting our appeal if we made a purely multiplayer game, and we’ve been looking into doing controls like in Brothers: A Tale of Two Sons, where one player can control two characters, one with each analog stick. After implementing it we found that it’s not too hard, and it means we can design puzzles and challenges that require two characters and still keep the game accessible for a single player. We do feel that challenges requiring 3 or 4 characters will also be necessary, and we’ve been trying to figure out how to add that in without detracting from the single player experience. We're going to try an experiment where one player controls all characters moving in sync around the ball before we settle on anything, although this idea seems like kind of a long shot. We would rather leave no stone unturned this early in the process though. It’s become clear to us what kind of game we want Morkredd to be; we want it to be a much deeper narrative experience than anything we’ve ever created before, and we also want to create a diverse set of challenges for the player to face. Playdead’s excellent Inside has inspired me greatly this year, especially the way it tells a story without words and, more subtly, how it paces it’s gameplay elements and set pieces so elegantly. It’s easy to shoehorn Inside into the puzzle-platformer genre on first glance, but if you look closer it has a lot of different types of gameplay, woven together like a rich tapestry. Providing relief for the player through a short climbing challenge, or a sequence of “simon says” gameplay or just a stroll through a corn field is crucial after the player figures out a tough puzzle. Giving the player a breather and showing him something rewarding after a particularly tricky challenge is definitely going to be in the back of my mind as I work on Morkredd’s level design. We're already making plans to bring Morkredd to GDC, make sure to drop by if you see us there and check out the demo! Love the atmosphere and the overall art direction. Nice idea to control the 2 characters with 2 analog sticks, I think it might work. Just a short update this week, as we have a ton of projects right now. Even so we've been working on improving our prototype so it's a bit more polished and playable without us standing over your shoulder. We also iterated on the player death animation and associated effects and added a time slowdown on death, so it's easier to see why you died, but we're not totally satisfied with it yet. Adding a camera zoom as well, and possibly starting the slowdown a bit more abruptly and then slowly going back to normal speed might work better. Soon I hope to be making some more content as well, so I'm hoping to post some more about that next week! Last week we were working on our respawn and death animations and we've landed on something we're pretty happy with. What do you guys think? Right now the main focus for us is getting a version of our game ready for GDC that conveys the game's key emotions, and we finally have a good grip on what scenes and moments we need. What we currently have shows what kind of puzzles we want in the final product, but it doesn't convey any story or any sense of danger, and these are things we need to improve in the following month. I'm very excited to show you guys what we're working on as we're ramping up for the show! We've been working on polish before showing off Morkredd at GDC and we added this sweet sand shader for the spikey area. What do you think? The sand has higher friction, so it takes more force to move the ball, forcing you to use more than two characters to move the ball quickly. A sand-specific enemy is also in the works, which I think will be very cool once we get it up and running. Personally I've been trying to get an overview of the different parts of the game, from story beats and arcs to mechanics. Right now it's still very rough, but the game's definitely heading in the right direction. It will be a challenging project but I think it's a great fit for our studio right now, it has just the right mix of "things we know how to do" and "things we have never done before". Great atmosphere. Really original concept also! Awesome! I like the atmosphere and the sound design. Great job! Looking forward to playing this someday! Just a quick post before we're off to San Francisco to exhibit at GDC. 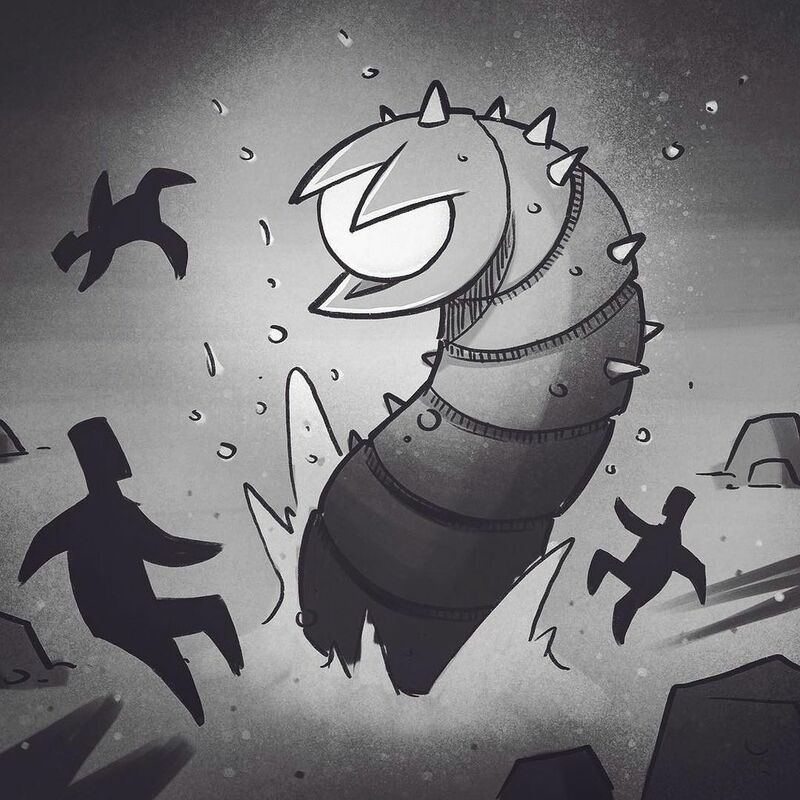 Our concept artist created this cool picture of the sand creature I was mentioning in the last post. It's obviously inspired by Dune and especially Tremors, but I'm excited to create some very tense gameplay sections with this guy! He will notice when the orb is being rolled over sand, and if he manages to chase you down he'll swallow the Orb, leaving you in the dark. The trick is to navigate to the nearest patch of solid ground, where he can't reach you. We're also experimenting with having patches of solid tiles on top of the sand where he can dig underneath but not emerge, but whenever he digs underneath he'll shake up anything standing on top, scattering the orb and players in different directions. If you're at GDC and want to try out Morkredd, drop by our booth at the expo floor! I've been seeing this on facebook (Indie Developers Group?) and the footage looks really nice. Very excited to see this giant worm popping up in-game! We just came back from showing Morkredd at GDC and it was great success! The feedback was mostly positive, and especially the art style was well liked. We learned a lot about how people approach the game and we learned that it demos much better if 3 people come as a group, rather than if 3 strangers are playing. Our demo level could have used some tweaks, but all in all it worked out well. Next time we will have a trailer or attract mode that can run while no players are playing, as we all got a bit tired of playing the same level over and over. We have a lot of great ideas for how we will take the feedback we got from GDC to make a great horizontal slice of the game, which will be our next step. Would love to know how you're dealing with the shadows, since you're doing this in Unity, yet have a lot of custom effects, as well as collision detection, going on there, so I take it it's some custom implementation we're dealing with here and not vanilla Unity? Litt lei meg over at tittelen på tråden ikkje har ø i seg, særs når til og med logoen faktisk har det! Great mechanic of having the ball be pushed!